The Papillon League is a breed specific competition for Papillon handlers. Its aim is to enhance the Papillon in the world of agility. The League will include all standards and abilities. world of agility. The League will include all standards and abilities. 1. PAL is open to pure bred papillons only. 2. PAL shall run from 1st November to 31st October annually. 3. Dogs compete in the following categories Grade 1 (Elementary) – For owners, handlers or dogs which have not gained a first place in an Agility Class or three first places in Jumping Classes at Kennel Club licensed Agility Shows. Grade 2 (Starters) – Open to dogs which are not eligible for Grades 1,3,4,5,6,7 and have not gained a first place in an Agility Class or three first places Jumping Classes at Grade 2 at Kennel Club licensed Agility Shows or elected to progress on points from Grade 1. Grade 3 (Graduate) – Open to dogs which are not eligible for Gradec1 or 2 or have elected to progress on points from Grade 2 at Kennel Club licensed Agility Shows and dogs which are not eligible for Grade 4,5,6 or 7. Grade 4 (Novice) – Open to dogs which have gained a first place in an Agility Class or three first places in Jumping Classes at Grade 3 or elected to progress on points from Grade 3 at Kennel Club licensed Agility Shows and are not eligible for Grade 3,5,6 or 7. Grade 5 (Intermediate) – Open to dogs which have gained a first place in an Agility Class or three first places in Jumping Classes at Grade 4 and are not eligible for Grade 3,4,6 or 7. Grade 6 (Senior) – Open to dogs which have gained a minimum of three first places at Grade 5 at Kennel Club licensed Agility Shows, one of which must have been gained in an Agility, not jumping, Class and are not eligible for Grade 3,4,5 or 7. Grade 7 (Advanced) – open to dogs which have gained a minimum of four first places at Grade 6 at Kennel Club licence Agility Shows. Two first places must be gained in Agility, not jumping, Classes. 4. Where dogs are competing at events other than licensed Kennel Club events they compete at grades equivalent to the grade definitions above. 5. A dog will remain in the same grade for the year. 6. The points system will be based on 20 points for a class win, 19 for second etc. All clear rounds in the course time earn one point. 7. Points can be claimed from all Kennel Club events, UK Agility and BAA events, unregistered shows and club competitions. Tina Iggulden who won the Harlie the Magnificent Trophy and Marion McIlherne who won best Novice. The 2014 Rules and Regulations are available below. The Registration Form can be downloaded by clicking this link. The Competition Points Record form can be downloaded from here by clicking on this link. 2. PAL shall run from 1st December to 30th November annually. Grade 1 (Elementary) – For owners, handlers or dogs which have not gained a first place in an Agility Class or three first places in Jumping Classes at Kennel Club licensed Agility Shows. Grade 3 (Graduate) – Open to dogs which are not eligible for Grade 1 or 2 or have elected to progress on points from Grade 2 at Kennel Club licensed Agility Shows and dogs which are not eligible for Grade 4,5,6 or 7. 8. 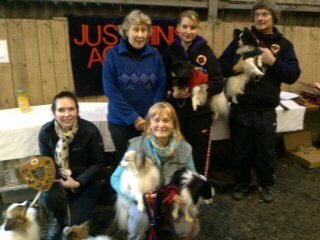 The cost of entry to PAL is £5.00 per dog per year which goes towards prizes, trophies rosettes etc.